NEW YORK, May 8, 2012 - Summer is coming and it's time to get weird! 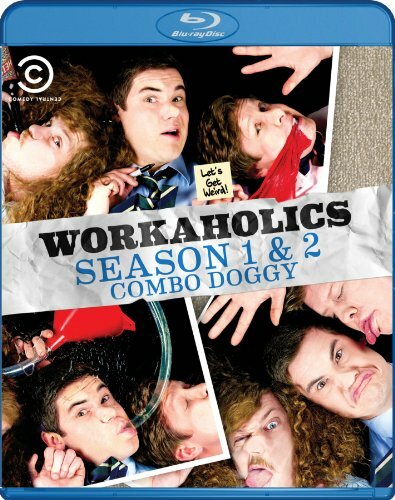 The "Workaholics" Season 2 DVD and the Workaholics: Seasons 1 & 2 Combo Doggy Blu-Ray will be released on June 5 by COMEDY CENTRAL Home Entertainment and Paramount Home Entertainment. The Season 2 DVD features all 10 uncensored episodes from the sophomore season, plus never-before-seen bonus features including: Behind the Scenes in the Writers' Room; Bloopers; Alternate Takes and Deleted Scenes; and "Drunkmentary" on all episodes. The Season 1 and 2 Combo Doggy Blu-Ray includes all 20 uncensored episodes from the first two seasons and an outstanding selection of bonus features: New Season 1 Behind-the-Scenes - Countdown to V-Town: Lead-Up to the Series Premiere; Behind the Scenes in the Writers' Room; Cast Interviews; Bloopers; Alternate Takes and Deleted Scenes; Live at Bonnaroo; "Drunkmentary" on all episodes; and more. The notorious co-workers and roommates, Adam, Blake and Ders, are back in their cubes and ready for more office hijinx in the third season premiere of the COMEDY CENTRAL hit series "Workaholics." Ten all-new episodes kick off on Tuesday, May 29 at 10:30 p.m., following the summer premiere of "Tosh.0." From the minds of the hilarious and irreverent Internet sketch group Mail Order Comedy, "Workaholics" is a single-camera comedy featuring three friends who work together from 9 to 5, live together from 5 to 9 and party together 24/7. Dress codes, deadlines and waking up before noon are not things these guys are used to. They do their jobs and sometimes they even do them well, but they show up late, leave drunk and always live for the day...even if they don't know what day it is. Whether it's Blake (Blake Anderson) dressed in a bear coat, Adam (Adam Devine) singing about Catherine Zeta Jones while high on mushrooms or The Ders (Anders Holm) celebrating his birthday with a drinking triathlon, the boys always seem to run into trouble wherever they go. The "Workaholics" Web site features a wealth of video content including a limited run web series, "Workaholics: The Other Cubicle," featuring your favorite cubicle neighbors "Montez," "Waymond" and "Jet Set"! The site also features show clips, exclusive video, cast interviews and behind-the-scenes action. The guys are active on Twitter (@UncleBlazer, @ADAMDEVINE, @ders808, @kylenewacheck), live tweeting each week on show nights. The "Workaholics" Facebook page is updated daily throughout the season and fans can follow the show's tumblr at workaholics.tumblr.com, featuring exclusive photos, videos and updates. In addition, mobile will feature a WAP site loaded with video content and periodic SMS challenges. Episodes from the third season of "Workaholics" will be available in SD and HD the day after air on iTunes, Zune Video Marketplace on Xbox, Amazon Instant Video and Sony Playstation Store. "Workaholics" was co-created by Mail Order Comedy's Blake Anderson, Adam Devine, Anders Holm and Kyle Newacheck and 5th Year's Dominic Russo and Connor Pritchard. The series stars Anderson, Devine and Holm and is directed by Newacheck. Executive Producers include Mail Order Comedy, Kevin Etten, 5th Year's Russo and Pritchard, Avalon Television's Richard Allen-Turner, David Martin, Jon Thoday and Isaac Horne, as well as Gigapix Studios David Pritchard. The series is co- executive produced by Avalon's Dan Lubetkin. Seth Cohen and Jackie Phillips are the Executives in Charge of Production for COMEDY CENTRAL.